Zechariah never saw it coming. There he was at the temple burning incense at the altar after having been chosen by lots, and suddenly an angel appears at the side of the altar and tells him he will have a son. If he hadn’t already been an older man, married with no children for so many years, perhaps he wouldn’t have taken it so lightly. But he had the nerve to question an angel and so he was struck dumb until the day of John’s circumcision. It shook all of his friends who saw him go into the temple. What could possibly have happened to their friend? Obviously, he wasn’t able to explain. Elizabeth didn’t have the same problem. She was speaking just fine, although she, too, was changed. She was pregnant. She was also apparently privy to a divine secret for when Mary came to help her through her pregnancy, Elizabeth knew her immediately as the “Christ-bearer.” “Who am I that the mother of my Lord should come to me?” When the day of John’s circumcision came, the elders worried about what name to give the child. Elizabeth demurely, yet factually, told them “his name is John.” Of course, she was only the child’s mother, so the men appealed to Zechariah to write down the child’s name. Once he wrote that the child’s name was indeed John his lips were opened and he immediately proclaimed a beautiful canticle of praise. It makes me wonder…have I ever questioned an angel? 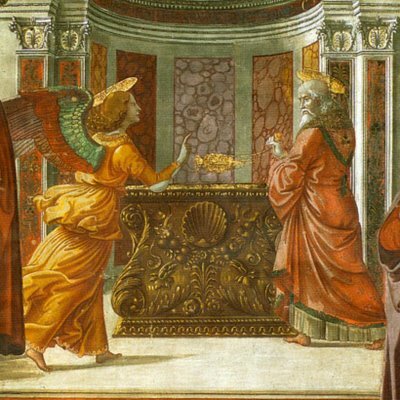 Throughout both the old and the new testaments, Angels act as messengers from God, alerting mortals that something big is going to happen and filling them in on how they will help God to accomplish it. They often pop in on someone, totally unexpected, and deliver the news. They may come to give divine assistance if it’s needed for an assignment to be accomplished. Sometimes they appear in dreams. Sometimes they come in disguise. It’s a strange time. I’m not living in the same world I grew up in and sometimes it’s hard to recognize it. There’s upheaval in the world among and within nations, and there’s upheaval in my life. I’m a child of the 60’s, a baby boomer. I’ve gone through upheavals before and I’ve never been afraid of change. As a matter of fact, I relish it. I thrive on it. But like Zechariah, I’m getting on in years and I’ve been afraid to face the angels that are being sent to me. What could God possibly have in mind? Why do these changes have to happen now? How many of us walk past our angels without noticing them, or miss the message they deliver? How many angels go unrecognized and overlooked? So I’m trying to look for the angels in my life so that I can recognize them when they come and not let their message blow by me. I want to be more like Elizabeth and Mary who didn’t question their angel, but accepted the message and let it be done. This entry was posted in The Church Diva and tagged angel, Catholic, change, Elizabeth, gospel, John the Baptist, Mary. Bookmark the permalink.